This easy recipe for saffron rice hails from the south of Thailand, where it is often eaten with roast chicken. Saffron rice makes dinner extra special and is nearly as easy to make as regular rice. You don't need to own a rice cooker to make this recipe - the rice is boiled in a pot on the stove but tastes very similar to steamed rice. And, unlike most saffron rice recipes, this one is fat-free. Pour stock into a medium-sized pot with a tight-fitting lid. Place pot on the stove over high heat. While the stock is coming to a boil, add the turmeric, saffron, chili, and a squeeze of lemon or lime juice. Stir well. Add the rice, plus 1 1/2 tablespoons fish sauce (or 1/4 teaspoon salt) and stir. Bring to a boil. When most of the liquid is gone, turn off the heat and place lid on tightly. Allow the pot to remain on the burner another 5 to 10 minutes, or until you're ready to eat. The residual heat inside the pot will finish steaming the rice. The rice will stay warm in this way for 1 hour or more (great if you're having guests!). Before serving, remove the lid and fluff rice with chopsticks or a fork (some of the crushed chili may have risen to the surface - just stir it back into the rice). Taste test for salt, adding 1/2 tablespoon more fish sauce or a little more salt if needed (how much will depend on the saltiness of your stock). If too salty, add another squeeze of lemon juice. 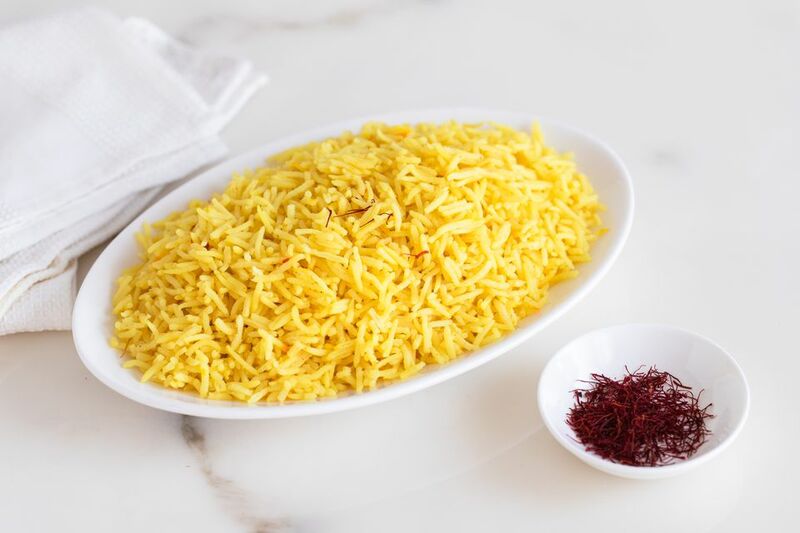 Along with the flecks of red chili, you may notice a few splashes of reddish-orange coloring throughout your rice - this is from the saffron, and is desirable. How Do You Make Traditional Thai Yellow Rice? How Do You Make Real Tom Yum Soup with Coconut Milk (Tom Khaa)?